Additional information such as the "Text and Mining declaration“ where signatories commit to granting the necessary copyright licenses to permit the text and data mining of copyright-protected content and other subject-matter on reasonable terms for non-commercial scientific research purposes in the European Union can be found here. There are many questions about this topic. This site will help to answer some of those. STM’s position paper on Text and Data Mining: Building a healthy and sustainable knowledge ecosystem for Europe. Find out more. 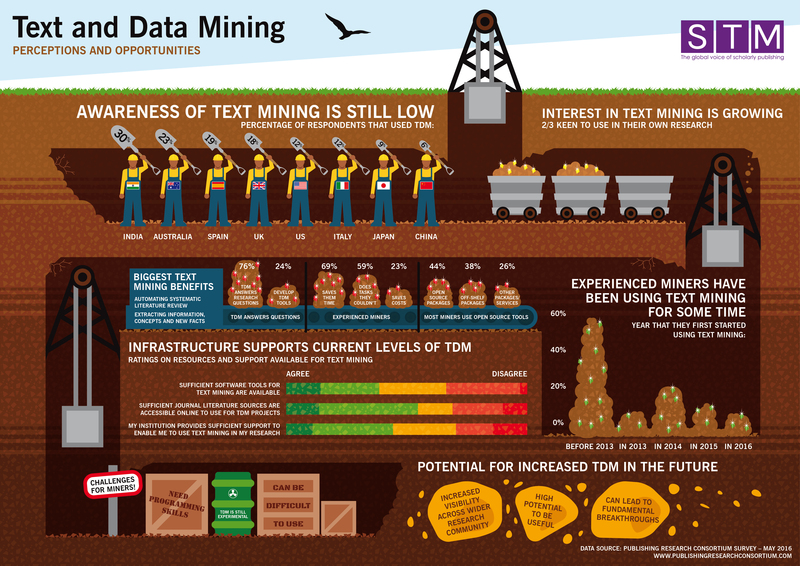 Data represented in the TDM infographic "Perceptions and Opportunities" are from the report "Text Mining of Journal Literature 2016" prepared by Maralte BV which can be found here.